I completed this painted fiberglass Indiana Bicentennial Bison for Vigo County which was installed in Griffin Bike Park in June of 2017. SIDE ONE is a memorial to Sgt. Dale Griffin, son of park founders Gene and Dona Griffin, who was killed in October of 2009 in an IED attack in Afghanistan. Also killed in the same attack were Sgt. Fernando Delarosa, Sgt. 1st Class Luis M. Gonzalez, Sgt. Issac B. Jackson, Spc. Jared D. Stanker, Pfc. Christopher I. Walz and Sgt. Patrick O. Williamson. Dale was an avid mountain bike rider and he along with his fallen comrades are represented as the seven bikers riding into the sunset. Below them is the Griffin Bike Park motto. The teepee image is from an actual photo of a teepee erected at the base in Afghanistan by the commander as a place for healing and reflection for the fellow soldiers. 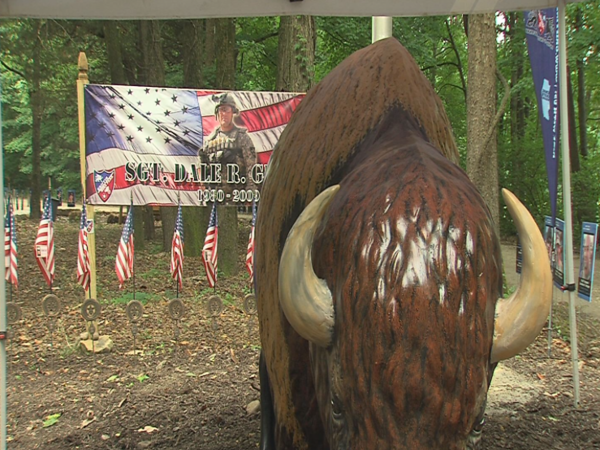 The infantry symbol, fittingly enough, is a buffalo. Below the teepee is the 1-17 infantry motto.